A one day state level workshop is held on 05.02.2019 by the Department of Sociology under the theme “Research Methodology and Project Work”. It is inaugurated by Prof.C.B.Honnu Siddhartha, Registrar (Evaluation), V.S.K. University, Ballari, by lighting the lamp. While addressing the participants, he opined that the research would bring into light the undiscovered things or objects through collecting appropriate and complete information by administering scientific methods. He instructed the students and young research scholars to stay away from the influence of values so as to maintain objectivity. It is necessary to form generalized principles on the basis of consolidated information. He said, research should focus on the current social problems. Prof. Basavaraj S Benni, Dean, Social Science, V.S.K. University, Ballari, is invited as a resource person. He has delivered lectures on different topics relating to research – The concept of research and its importance, research design, collection of data, analysis of data, derivation of results and various steps in report writing. 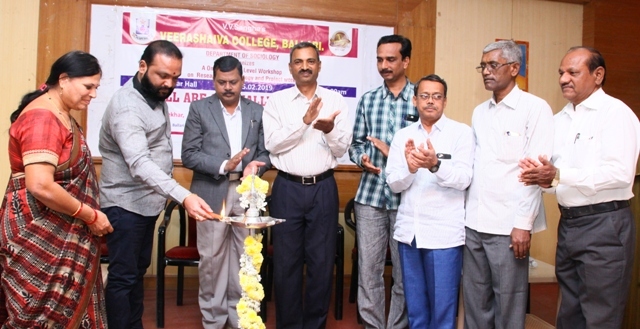 Shri Gonal Rajashekhar Goud, Chairman, College Governing Council, presided over the function. In his presidential speech, he spoke about the dimensions of research. He expressed dissatisfaction over the decline of quality in research. Only good quality research could provide solutions to man’s problems. The researchers should focus more on undiscovered things, he suggested. Before concluding his speech, he also suggested to use research knowledge for the progress of society. Dr.G.Rajashekhar, Principal, welcomed the guests and the participants. Shri Halakundi Satish Kumar, Member, CGC, is present in the inaugural function. Sri Siddaram G Mulaje while compeering the programme delivered and introduced the nature and objectives of the workshop. Dr.H.B.Jalajakshi, proposed vote of thanks. Kum.Poornima presented prayer song.